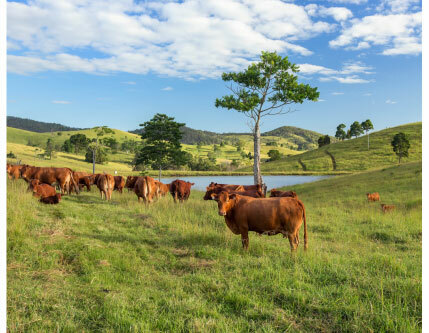 Rich and fertile scrub country second to none totalling 169 acres (68.52ha) in 4 freehold titles located in the highly sought after farming district of Gilldora a short 10 minutes drive South of Gympie. Featuring undulating thick lush pastures covering deep red volcanic soils, 10 dams and multiple spectacular house sites capturing spectacular 360 degree views over the region including Mount Cooroora to the South. Each of the 4 titles have long frontage to the Mary Valley Highway and double road frontages to 2 of the titles providing multiple options for future gain. Currently carrying 60 breeders, the pastures have been fully improved with Rhodes grass, Green panic, Legumes, Seco Stylo and Lotononis. Fenced into 4 paddocks, there is a set of timber cattle yards, covered race and loading ramp on the largest title totalling 47.93ha with the other titles totalling areas of 2.53ha, 3.94ha and 14.11ha all enjoying the same magnificent aspect. This is a rare offering of pure quality country, multi-titled in the fastest growing district of the region, primely located 10 minutes South of Gympie, 30 minutes to Noosa Heads and 1.5 hours to Brisbane.